Skiing from the Col du Mont Brulé. The Haute Route is an unique experience. There are few places in the world where skiers can travel unencumbered, in the heart of the mountains, over high cols, hidden valleys, and immense glaciers. The complex system of huts in the Alps permits us to enjoy the skiing as only traveling light can. And the Haute Route, with its logical start and finish gives us a goal and a line to follow, both improbable and impressive. For all the times we have done this tour, we are continually fascinated by its endless variation. The changing snow, sky, and company bring a freshness to each passage. Most years, we do two different Haute Route tours, the one described on this page, via Verbier, and a harder version which traverses the Plateau du Couloir. For more information on the Plateau trip, click here. The Haute Route via Verbier is by far the most popular version of the Haute Route, The skiing is excellent, with every day offering at least a few good opportunities for some fun downhill. Though there is some technical terrain, particularly on the first day at the Col du Chardonnet, and later on the ascent of the Sepentine, for the most part the route is reasonabley straightforward and difficult days are interspersed with easier ones. Additionally, the Verbier version of the tour offers a few more options for poor weather with some stages (but not all) practicable in marginal weather. It remains, however, a serious challenge, and all the potential difficulties (and fantastic rewards) of high alpine touring can be found. We run this Haute Route trip at a low skier to guide ratio of 4:1. The low ratio increases security on steep ground and allows us to better customize the trip to the groups needs. Our tour begins with a spectacular 9000 foot descent of the Vallée Blanche. For the next 7 days we ski hut to hut beginning in France and soon passing into Switzerland through the heart of the Alps. We cross into Switzerland, arriving at the Trient hut on our third day. 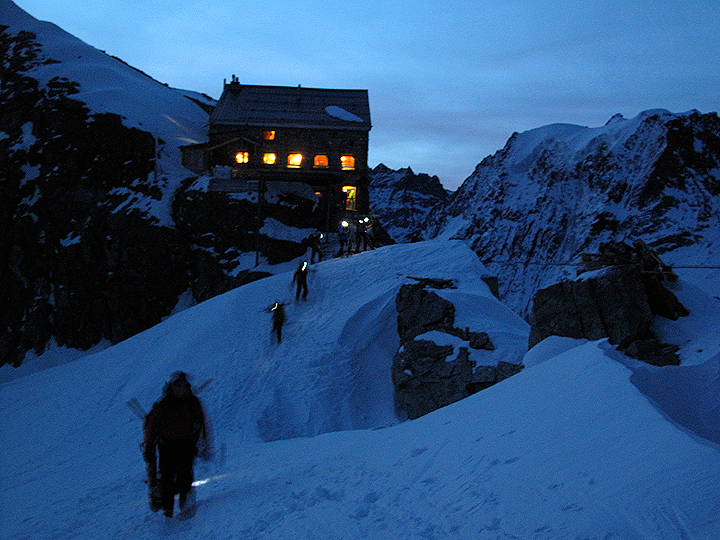 On day 4 we pass through Verbier and continue on to the Prafleuri Hut, then the, Dix and Vignettes huts on days 5 and 6. On the last day we enjoy the great final descent into Zermatt. We have included an additional day to our itinerary. One more day may allow us to complete the tour, when bad weather or conditions force a halt. If all goes according to our original planned 7-day itinerary, we have an extra 8th day to ski in the Zermatt area or to carry on to Saas Fee. Please see the last part of the itinerary below for more details. This ski tour requires a high level of fitness and excellent skiing abilities. The second day of touring, from the Argentiere hut to the Trient hut is long and complex. And the last day, from the Vignettes hut to Zermatt is equally challenging. You need to be in good shape. Skiing skills need to be at an advanced to expert level. The reason for this has more to do with the conservation and expenditure of energy over a long day than the absolute technical difficulty of the skiing. There are a few steep sections, such as approaching the Col des Ecandies on Day 3, but for the most part the slopes are not overly steep. The challenge comes in managing poor snow conditions (heavy wet snow, crud or breakable crust) and not losing too much energy in the process. Great skiers look like they are hardly working, and this is in fact the case. If your skiing is not up to par you will spend far, far more energy than a better skier. There are sections on this tour where we will be skiing slopes of up to about 40 degrees in steepness. This is quite steep, and usually in this terrain we will be traversing or perhaps side slipping down to easier ground. However, we also need to be able to do turns on these very steep slopes, usually parallel hop turns, or other quick turns where little momentum is generated. On slopes of this steepness, if the snow is firm (as it often is) a fall will most likely result in a slide, and, with hazards such as rocks or crevasses below, such a slide will lead to potentially very serious injurly. If you fall on these slopes you will get hurt! Ability to turn comfortably through the fall line in difficult deep, heavy snow, or bad breakable crust. Ability to consistently execute parallel hop turns or pedal-hop turns on 40° firm snow. Ability to ski the fall-line with short-radius, rhythmic parallel turns in deep light snow. Ability to side-slip, both forward and backward, on firm 45° slopes. Ability to skate on level ground. Skiers who regularly enjoy black or double black runs in most western American ski areas should do fine. If you like to get off the piste and into the crud, ski the trees, and in general look for the steeper shots, you'll probably have a great time on this tour. If you tend to stick to the groomed slopes and find the wild untracked a bit intimidating this is probably not a good tour for you. We will likely encounter all different kinds of snow, from the best to the worst, and you need to have sound energy efficient strategies to cope with them. A good gauge of you ability is found in mogul skiing. If you are good in the bumps and seek them out, then you most likely have developed the rhythm and balance needed for steep or difficult snow. You must be able to ski fairly steep bumps in good conditions, skiing rhythmically and fluidly, following a line near the fall line with good speed control. If you have any doubt about your ability to manage the skiing on this classic route, please join us in the Alps for a shake-down training session. 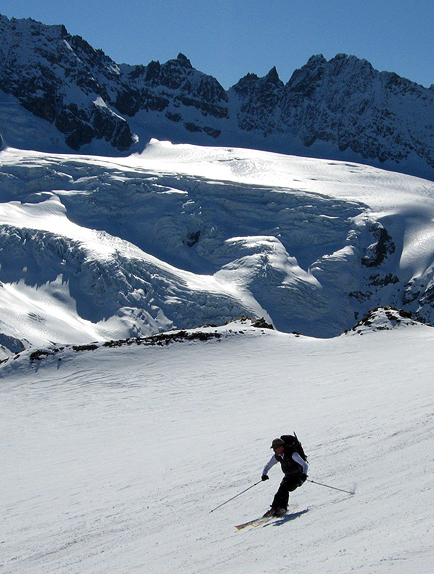 See our page on Chamonix off-Piste skiing. 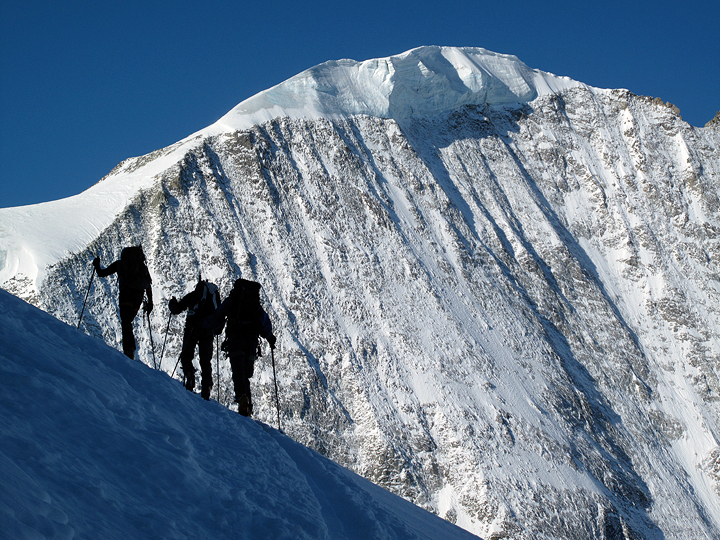 Or, you may want to consider a Private Haute Route Program. You need to be able to do quick and easy kick turns, facing into the mountain. We will review these skills en route, but you'll have to be expert at them by the second day! Previous mountaineering skills are useful, but not required. If you are an expert skier, you will not have difficulty picking up these new skills, as you will already be comfortable on very steep slopes. This itinerary is suitable for advanced/expert skiers in excellent condition. For more detailed information and maps and photos, see the day-to-day description. Vallée Blanche ski descent. Hotel night in Chamonix. From the Grands Montets, down to the Argentière Glacier and up to the Argentière hut. Over the Col du Chardonnet and the Fenêtre de Saleina, to the Trient Hut. Over the Col des Ecandies to Champex. From Champex we continue to Verbier by taxi, ride the lifts, then ski down a short ways. We then leave the ski area, touring to the summit of the Rosablanche, and descend to the Prafleuri hut. Prafleuri hut to Dix hut. From the Dix hut we ski up over the Serpentine and the Pigne d'Arolla and down to the Vignettes hut. A great day's skiing to Zermatt. First up over the Col d'Evêque, then over the Col du Mont Brulé, the Col de Valpelline, and finally a fantastic run down the Stockji Glacier to Zermatt. Schwarztor, the ultra-classic glacier descent from the Klein Matterhorn. A ski ascent and descent of the Cima di Jazzi, a fun ski peak above the Gornergrat and Findel Glacier. Over to Cervinia for lunch and back again to Zermatt. A day skiing the pistes of Zermatt and Cervinia. A ski ascent of the Breithorn, the local ski 4000er. The last day of the Hatue Route, skiing into Zermatt below the Matterhorn.